When the Publish window appears, select CD. The browser title bar when learners view your published interaction in a browser window. The top bar of your interaction player if you've opted to include the title as one of the player features. the Description field, you can enter descriptive text about your interaction. (When you publish for CD or other local source, any text you enter here won't be visible to your learners, but it'll be saved as part of your project and you'll be able to see and edit it here if you later return to the Publish window. The description is visible to learners if you republish for a different destination, such as the Web, Articulate Online, or LMS. Important! Always publish to your local hard drive. Publishing to a network drive or a USB drive can create problems with your published output. After you publish your interaction to a local folder, you can burn it to a CD or DVD or move it to some other local destination. The Properties section of the Publish window allows you to make last-minute changes to your interaction player and the compression settings Engage uses when publishing. 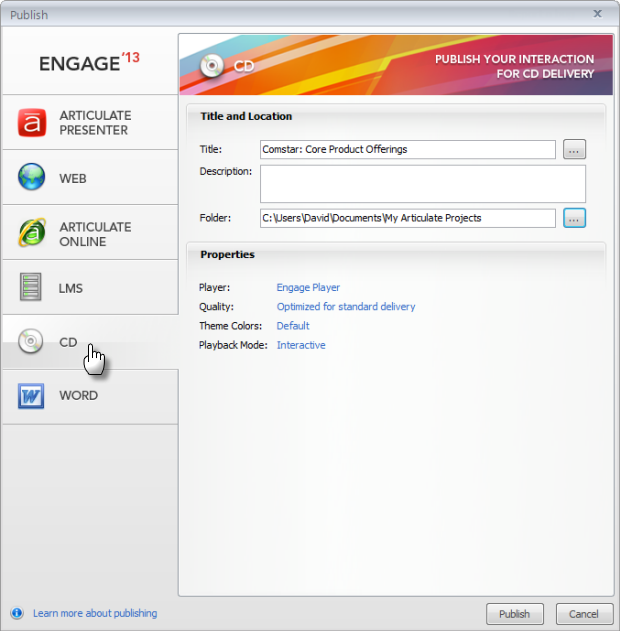 The Player field shows the name of the player that Engage will use when you publish. (The player is the interface that users see when they view your interaction.) Click the player name to make final adjustments to your player or switch to a different player. If you need help choosing your player settings, see Customizing the Engage Player. The Quality field lets you control the compression settings Engage uses for the audio, video, and pictures you've added to your interaction. The settings here default to whatever you used the last time you published an Engage project. To change the quality settings, click the blue text and change any of the fields as noted below; then click OK. Choose Custom to define your own quality settings. Then click and drag the slider on any of the three values to change the compression. Using higher values gives you higher-quality output but also larger file sizes (which means longer download times). 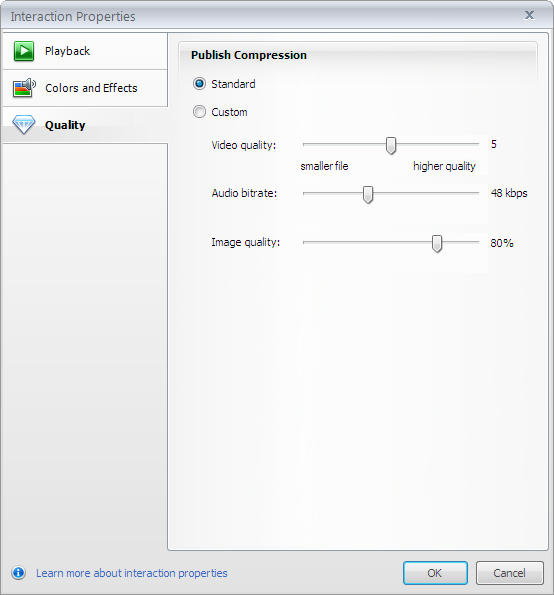 Lower values give you smaller file sizes and faster download times, but the visual and audio quality will be lower. Choose Interactive to give learners the freedom to view steps in any order. If you mark this option, you can also mark the box to Show preview/next buttons to provide navigation buttons in the lower right corner of the player. Unmark this box to exclude previous and next buttons. Choose Linear if you want learners to view all the steps in order. 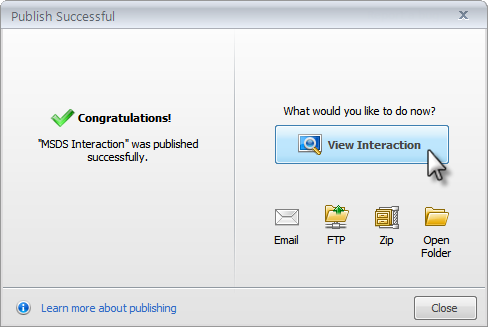 View Interaction: This launches your interaction so you can view your output. Email: This opens up a new email message with a zipped file of your published output attached. This makes it easy to share your interaction with a subject matter expert (SME) or reviewers, or to send the interaction to someone who will place it in the location from which it'll be deployed. FTP: This opens a window where you can enter your FTP credentials and transfer your output to your website. This probably isn't something you'd need or want to do, since you've chosen to publish for CD, which optimizes your content for local deployment instead of online deployment. Open Folder: This opens a file viewer where you can see the files Engage just created. There will be several folders and files, and the file that launches your interaction is called Launch_Interaction.exe. There’s also an autorun file, which causes your presentation to launch automatically if learners insert a CD or DVD containing your published output. Now that you've published, you can burn the files to a CD or DVD, or you can copy them to any destination for deployment. Note: If you burn your interaction to a DVD, it must be played in a computer DVD drive. It won't function in a DVD player on a TV.